Are Fortified Oils Good For Health? Achieving good health for the family requires more than just supplying good food. When it comes to individual nutrition requirements in a family, it varies vastly. Nutrition requirements of your child, your partner or your parents are certainly different from each other. Similarly, life styles also vary. Though we are living in an urbanized community, anybody can fall prey to malnourishment and not be aware of it. Especially, your busy husband, naughty children, choosy parents or yourself. Most of our diets today are either deficient in essential vitamins and minerals, or the nutrients are destroyed through intensive processing. Vitamins are a vital component necessary to maintain life. , However, a vitamin deficiency can put your health on the line and could make your life complex with several health issues. Most food industries have started catering to this need by finding suitable vehicles to fortify food to prevent micronutrient deficiencies. Cooking oil is one such medium that is used to carry micronutrients. Did you ever think cooking oil could be a good source? We all know that cooking in our kitchen doesn't start without using oil. So, the best way to support our family is to use fortified oils for cooking that will meet the daily vitamin needs of a person, on the days you're eating habits are just not right. Fat soluble vitamins like A, D E and K are easily soluble in fat , and edible oils are the best vehicles to provide these vital nutrients to every member in the family. 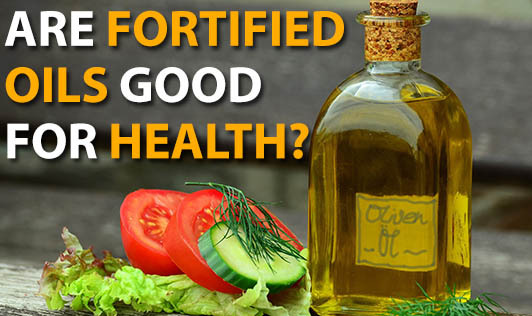 How is fortified oil beneficial?? In the present scenario, the ongoing trend is to use refined oils and a "low fat diet" for disease prevention. This has led to a constant reduction of oil consumption that is the direct source for these fat soluble vitamins in our diets. Though a reduction in unhealthy foods that are soaked in oil is a good change, it is important for one to know which oil should be used in which way. A lack of exposure to UV rays from the sun in the mornings has reduced the human body's potential to synthesize vitamin D. Hence, using fortified oils will ensure that the body is receiving its daily dose of these vitamins. Are the vitamins stable in fortified oil? The packaging of these oils ensures that the oil is protected from oxidation by air and sunlight. Also, the addition of antioxidants increases the shelf life by preventing it from turning rancid and keeping the nutrients intact. However, one should remember that repeating the same oil for frying will lead to loss of nutrients in the oil. Now that you know the importance of fortified oils, make use of this in the right way and be sure of getting your daily vitamin dose!